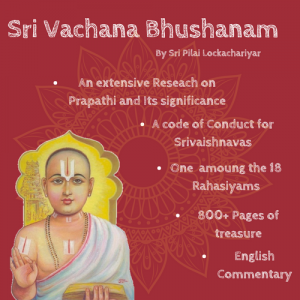 Introduction: This is the 31st of the 32 Paddhathis of SrI RanganAtha PaadhukA Sahasram and has 20 powerful slOkams embedding deep SrIvaishNava Tatthvams. After describing the glories of the Paadhukais of the Lord in words and geometrical patterns ( Chithrams) , Swamy Desikan laments now over the time that he lost sofar in chasing pursuits other than dedicating himself to the worship of the Paadhukais . He asserts here that He is clear now about the power of the Paadhukais to confer the Moksha Sukham. He states that the Paadhukais are His Supreme Knowledge (Para VidhyA). Until now, Swamy Desikan eulogized the many Vaibhavams of the Lord’s Paadhukais (viz), Swamy NammAzhwAr. The Paadhukais were pleased and appeared before the mind’s eye of Swamy Desikan and filled Him with the delectable anubhavam of their Asccharya Roopa, Svaroopa and GuNa vyApArams . The Paadhukais blessed Swamy Desikan with visEsha Tatthva Jn~Anam and ananyArha Sesha Vrutthi (the way of sole servitude to the Paadhukais ) .The Paadhukais chased away all obstacles to such sEsha Vrutthi and displayed matchless soulabhyam ( ease of access ) and souseelyam. Swamy Deikan was inundated with that BrahmAnandham of mingling with the merciful Paadhukais & the Lord and felt that He was enjoying the anubhavam that one enjoys at SrI Vaikuntam performing Nithya Kaimakryam to the Lord there. This mental visualization suddenly disappeared and Swamy Desikan was left with the physical visualization of the ArchA roopam of the Paadhukas of the Lord. His experience of indescribable bliss concluded now.He was reminded harshly about his lot among the kumathis ( people with false knowledge)and Bhagavath vimukhAs ( who are indifferent to the Lord). 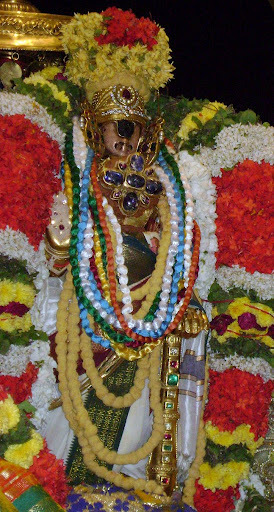 He became worried about the terrible effects of the pancha Indhriyams over him and the power of Kaama-KrOdhams and other adverse guNams.Swamy Desikan now attained a state of dejection and despondency like Swamy NammAzwAr expressed in ThiruvAimozhi about the hopelessness of His lot as a Nithya SamsAri. Although Swamy Desikan and Swamy NammAzhwAr are evolved souls, who had conquered all the above adversities , they empathized with the lot of SamsAris and enacted the sufferings of the Nithya samsAris to illustrate the lowliness of the SamsAric way of life. The great First Acharya, the Lord Ranganatha, had furnished the Paaduka as a Supreme Vidya, as a path for Moksha; this path has been specially appropriate to poor pitiable persons with little equipment of any type; the Lord has provided it in His great grace. That Paaduka Devi I cling to as my sure means of salvation. 1) UtthamUr Swamy’s anubhavam : I recognize the PaadhukAs as the means for Moksham. They represent the true knowledge about the ways to achieve Moksham and serves therefore as Para VidhyA . The Lord, the teacher of all teachers, has given to us the PaadhukAs out of His compassion for us helpless beings. 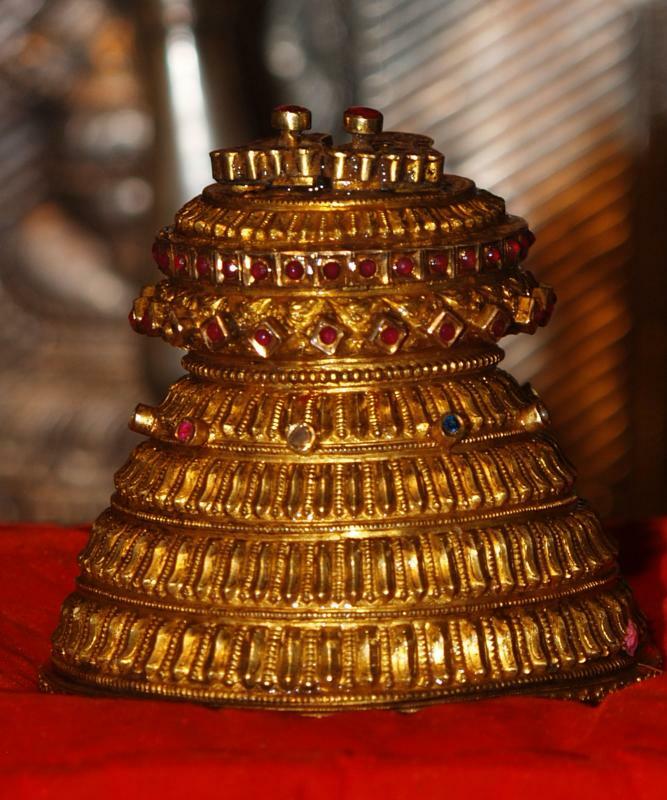 Adorning the PaadhukAs on our heads is the way to Moksham is the upadEsam of Swamy Desikan. 2) SrImath Andavan’s anubhavam: Swamy Desikan laments that the Paadhukais acted as though they were saving him and abandoned him however to suffer in samsAram . Swamy addresses the Paadhukais sorrowfully about its neglect and begs for its grace to save him from the horrors of SamsAram in amood of nirvEdham (Despair and sorrow ) . Oh PaadhukE ! Your Lord has shown the two UpAyams of Bhakthi yOgama nd Prapatthi yOgam to lift the suffering samsAris from the terrible ocean of SamsAram. You have been assigned to come to the rescue of SamsAris by Your Lord. While that is the case , how can you bandon me and look at me in this amused mode ? What can I do over Your indifference? Is it fair for You to act like this ? 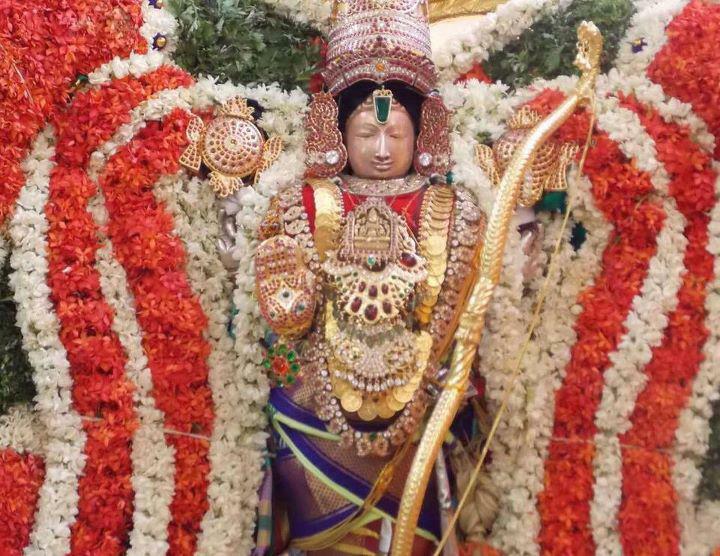 Therefore , I perform Parapatthi once more to You and seek You as my refuge.Please remove fully the bonds of SamsAram and grant me the Parama PurushArTam of Moksham instead of the temporary and fleeting experience of Your guNams through Maanasa SaakshAthkAram. 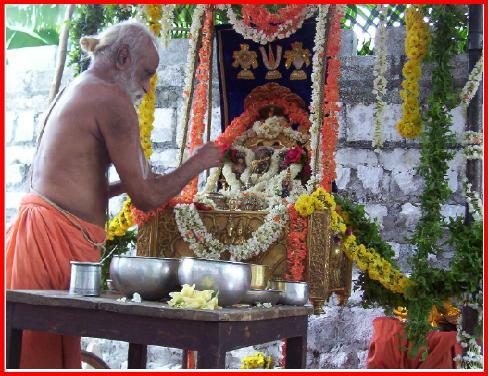 3) Swamy Desikan performs direct SaraNAgathy before the Paadhukais : ” DEveem PaadhukAm PrapadhyE “. He reminds the Paadhukais that its merciful Lord, who is the Universal AchArya, has created the routes of Bhakthi and Prapatthi for our salvation . He has annointed You , His PaadhukAs , to a status equal to that of Para VidhyA (Jagath Guru: DayamAna: Svayam dheenAnAm ThvAm PaadhukA DEveem ParavidhyAmiva arpayathi)….(V.S) . பொருள் – அனைத்து உலகிற்கும் முதல் ஆசார்யனாக உள்ள ஸ்ரீரங்கநாதன் மிகவும் கருணையுடன், துன்பம் உற்றவர்கள் உய்யும் விதமாகச் செய்வது என்னவென்றால் – மோக்ஷ ஸாதனமான பக்தி மற்றும் ப்ரபத்தி என்னும் ஞானம் போன்ற தனது பாதுகைகளைத் தானாகவே அளிக்கிறான். அந்தப் பாதுகைகளை நான் சரணம் அடைகிறேன். Oh Paaduka! Previleged are those persons doing pious services at the Feet of Lord Ranganatha, respectfully submitting You at the Lord’s Feet for being worn! Will I be ever enabled, by virtue of flawless acts of mine, to secure another birth to do similar service to the Lord? Please do grant one such! 1) UtthamUr Swamy’s anubhavam: Oh PaadhukE! May I become one of the fortunate few , who become blessed to present You at the appropriate times to Your Lord with humility. May I be blessed with this boon to become sinless and to engage in such services to you atleast in my next birth , if I miss that opportunity in this birth. Swamy Desikan talks about here about the next birth , although those who gain moksham through the grace of the PaahdukAs do not have any more births. This statement is indicative of Swamy Desikan’s special joy in serving RanganAtha through PaadhukA Kaimkaryam instead of staying in Vaikuntam as a result of attaining Moksham.Earlier in SrI VaradarAja PanchAsath , Swamy Desikan has stated in a similar vein that he would prefer to return to this earth to serve and enjoy Lord VaradarAjan than staying in Vaikuntam without any rebirths (Vaikunta VaasEapi na mE abhilAsha:). Parasara Bhattar, the precocious son of KurEsar , the prime disciple of AchArya RaamAnujA also expressed a similar sentiment .It appears that all the servants of Ranganatha are equal in status to those , who permanently reside in SrI Vaikuntam. 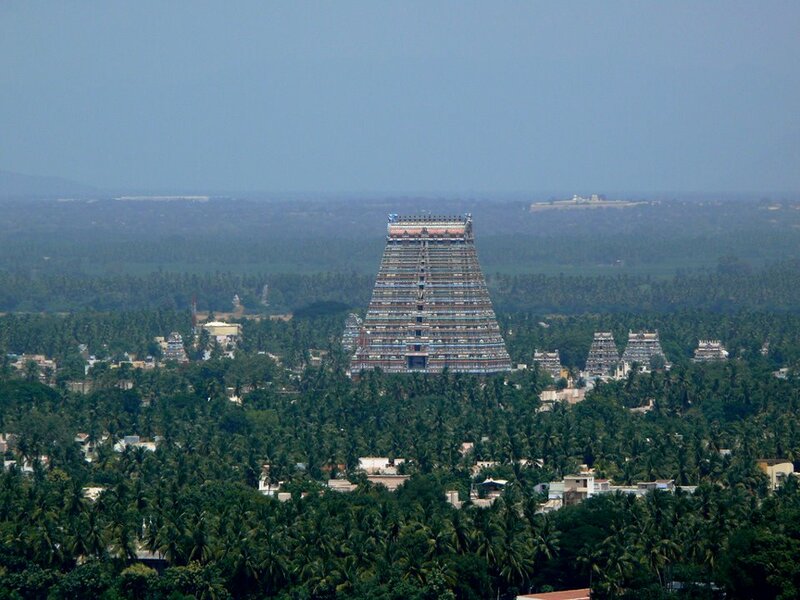 That is why SrIrangam is known as BhUlOka Vaikuntam . 2) SrImath Andavan’s anubhavam: Oh PaadhukE ! It does not matter if you do not grant me the Parama PurushArTam of Moksham after removing my sambhandham with this physical body. It will be sufficient for me if You grant me another birth with a body to be born as the archaka for Lord RanganAtha to present You ( PaadhukAs) to Him on the prescribed occasions ( Uchitha Kaalams) . Kaimkaryam to You (Paadhukais) will be sufficent in this earth than Moksham itself .Please bless me with the BhAgyam to be born as an Archakar of Lord Ranganatha . Wherever I am , May I be blessed to be engaged in uninterrupted kaimkaryam to You .That itself is the equa to Moksham. May I be engaged in Bhagavath PaadhukA Kaimkaryam right here if I do not get to enjoy the BhOgyA adhisayam at SrI Vaikuntam. 3) Oh PadhukE! The ArchakAs of Lord RanganAtha present You to Him with humility during His Uhtsava Kaala sanchaarams and during the six Aasana kaalams linked to His AarAdhanams (PaadhukE ! yE imE vinayEna samayE ThvAm Rangabharthu : padhayO: samarpayanthi ). 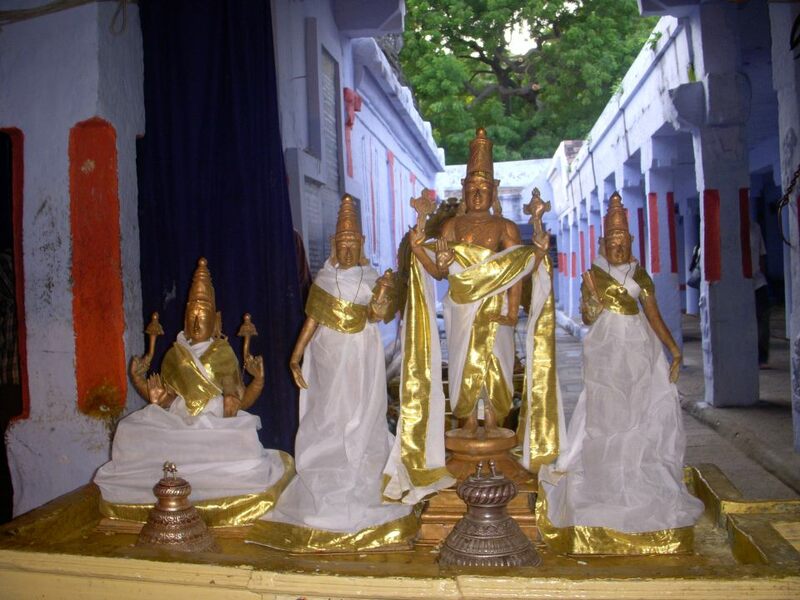 Incidentally , The ArchakAs of Lord RanganAtha belonging to five gOthrams are said to have descended with their Lord to perform exclusive AarAdhanam for Him . 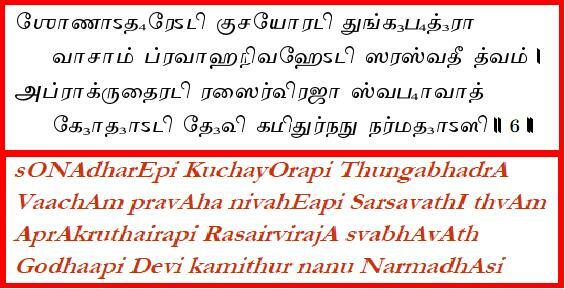 Swamy Desikan points out that the ArchakAs are rid of all sins through such Kaimkaryams ( anagai: karmabhi: Idhrusa: ) and prays for the boon of being born as Lord RanganAthA’s archakan in the next Janmam ( Karmabhi: Idhrusa: parasmin janmani api bhavEyam)…(V.S). பொருள் – ஸ்ரீரங்கநாதனின் பாதுகையே! அந்தந்த காலங்களில் ஸ்ரீரங்கநாதனின் அர்ச்சகர்கள் உன்னை அவனது திருவடிகளில் மிகவும் அன்புடன் ஸமர்ப்பணம் செய்கிறார்கள். எனது அடுத்த பிறவியில் இவர்கள் போன்று ஸ்ரீரங்கநாதனின் அர்ச்சகராகப் பிறந்து உனக்கு கைங்கர்யம் செய்வேனோ? Oh Lord’s Paaduka! Infinite Time has passed from immemorial beginning, many Brahma-incumbents have come and gone and time goes on,-as You go on bearing the Lord! But I remain just like this. Oh Alas! I have not yet learnt to perfect my heart for a meditation, clinging to You as a good auspicious prop! 1) UtthamUr Swamy’s anubhavam: Swamy Desikan dwells on the timeless service that the PaadhukAs do for the Lord such as supporting the Lord , taking Him on His rounds. 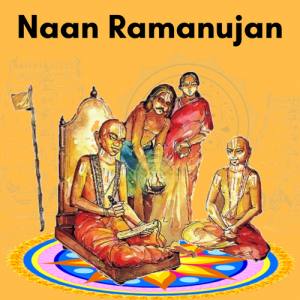 He calls those services Ananta vAhanam in contrast to vahanam, which means passage of time of specific duration . He says: ” Oh Lord’s PaadhukE ! Time rolls on and ends the reign of BrahmAs , even if they rule for a very, very long time. Even their reigns have a finite time elements built into them. Your rule in contrast has no time boundary . You perform Your endless service to the Lord without any interruption across the time scale. May I be blessed with the type of eternal service that You do from now on, even if my mind has not reached out to You so far as my blemish-free companion? 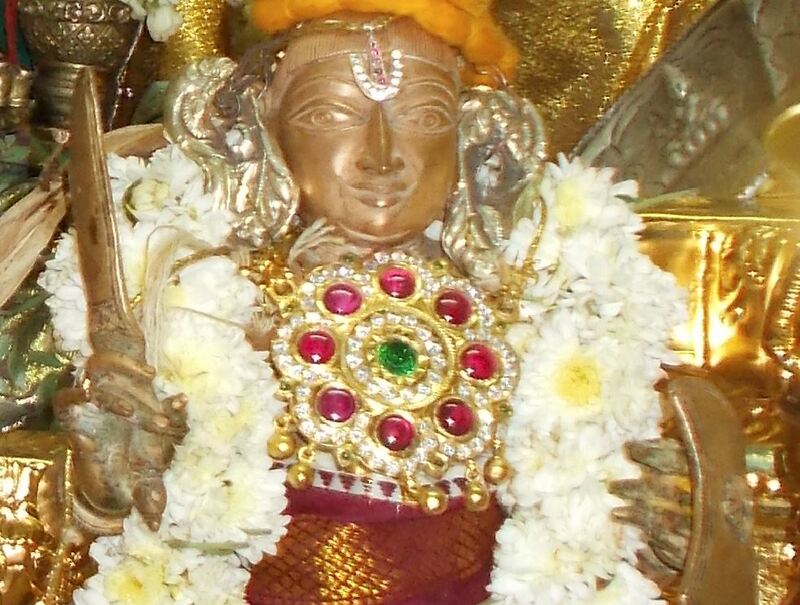 2) SrImath Andavan’s anubhavam:Oh PaadhukaE with MahA Vaathsalyam towards bhaddha Jeevans ! 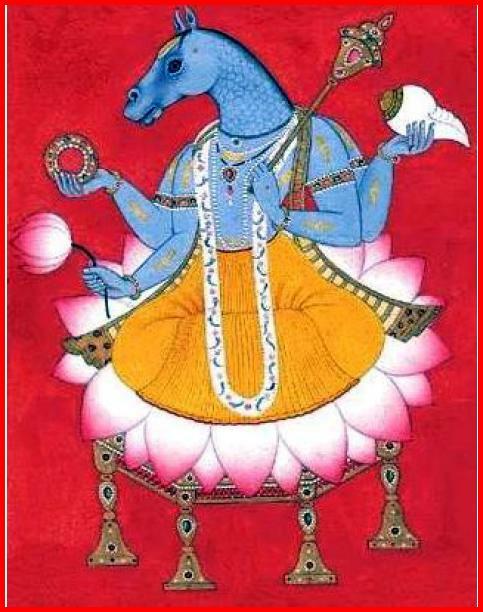 Over countless aeons (Brahma Kalpams ), You create innumerable jeevans ( give new bodies to them after PraLayam, when they were in a sookshma state) and wait patiently to see if those embodied Jeevans will now comprehend Your and Iswara Tatthvams to become liberated from their bound states ( Bhaddha dasai to Muktha Dasai ). For fulfilling that goal, You carry Your Lord on Your back so that the embodied Jeevans can have His darsanam and get uplifted to perform SaraNAgathy at His sacred feet . Alas ! these Jeevans due to their load of sins do not take advantage of Your krupA and go round and round in the whirlpool of SamsAram and Time ( Kaala PravAham). They miss to recognize You and are lost in SamsAric afflictions. I am aslo one of those Paapis , who has been immersed in the terror-striking waters of SamsAric ocean and have lost you until now. 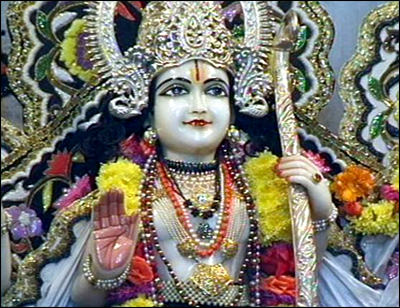 Now I recognize that You have blessed me as an excuse for a small good deed that I might have done regarding Bhagavath-BhAgavatha Kaimkaryams and given me the intellect to enjoy You ( BhOgyathA Buddhi) and thereby long for a status , where I can completely cast aside the ruchi for transient SamsAric pleasures and be immersed in uninterrupted dhyAnam about Your roopam , Svaroopam and GuNams. Alas ! My mind however does not stay put in such dhyAnams due to the burden of my Paapa Raasis . What a Pity ? பொருள் – ஸ்ரீரங்கநாதனின் பாதுகையே! எனது பாட்டன், அவனுக்குப் பாட்டன் என்று தொடங்கி நான்முகன் வரையுள்ள பல உயிர்களும் மாற்றி மாற்றி ஸம்ஹாரம் செய்யப்பட்டும், ஸ்ருஷ்டி செய்யப்பட்டும் செய்வதான காலச்சுழற்சி என்பது, நீ ஸ்ரீரங்கநாதனை தாங்கியபடி உள்ளது போன்று, எல்லையற்ற காலமாக இயங்கி வருகிறது. ஆயினும் எனது மனமானது, த்யானிக்கத் தகுந்த மிகவும் உயர்ந்த வஸ்துவாக உள்ள உன்னைக் கைக்கொள்ளாமல் இருக்கிறதே! Oh Paaduka! 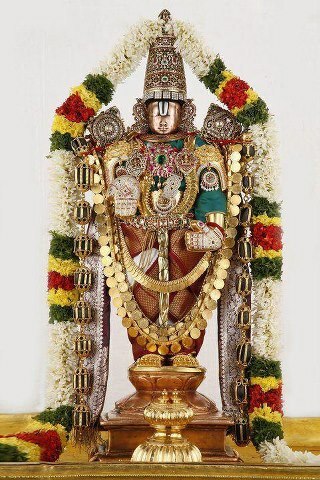 The Lord is a treasure, invested with Sri, namely, the Goddess of wealth. This treasure has no want; it is so fully endowed with all one can ask for. It lies almost securely safe-guarded, under Ranga-vimana. And for me to secure it, You are there to help. Nevertheless, this heart of mine goes in vain search of someone or something, the very antithesis of this treasure! Alas! what to do? 1) UtthamUr Swamy’s anubhavam: Here , Swamy Desikan expresses his sense of anguish over his mind running all over the place except to the site , where the Supreme Lord and His PaadhukAs are residing under the Ranga Vimanam . He says: ” Oh PaadhukE ! Your Lord is beyond all desires . He has every thing. He is the One , who removes our desires for material and mundane , which affect our spiritual progress. Since there is nothing that is superior to Him , we get our desires for other things eliminated . When we have to engage our mind in that Supreme object , which gives every kind of boon, I do not understand why my mind drags me to nonlasting things , which can never match up to the eternal Lord. He is like a golden treasure and you are able to bring that treasure in front of us. Why does my mind then get distracted by other impermanent and sorrow-producing things ? 2) SrImath Andavan’s anubhavam :Swamy Desikan expresses his nirvedam here by recalling that his mind is steeped in in SamsAric activities, which cause nothing but sorrow, while the SaThAri (PaadhukA of the Lord) is there to create the Sambhandham ( links) to the all powerful Lord of Srirangam , who is the divine consort of MahA Lakshmi , who is the grantor of every kind of wealth. Swamy Desikan compares his sorrowful status to that of a poverty stricken human being engaged in paltry efforts to earn a small amount of money , while he knows about the existence of a great treasure, which can be unearthed with the help of a manthravAthi (who knows the code). 3) Oh PaadhukE ! RanganAtha is a Nidhi ( treasure) ; this nidhi is easy to access and it has nothing to desire for ( avAptha samastha Kaamathvam) . While such a magnificent treasure with MahA Lakshmi is there at he centre of Ranga VimAnam (KamalAdhyushithE nireehE sulabhE nidhou kOsa madhyE thishtathi sathi) and while , You (Paadhukai) are like the magician who can reveal that Nidhi , my mind runs after useless other things ( Thvayi sTitAyAm mE mana: param anvicchathi)…(V.S). பொருள் – ஸ்ரீரங்கநாதனின் பாதுகையே! ஸ்ரீரங்ககநாச்சியாரால் எப்போதும் வாஸம் செய்யப்படுவதாகவும், உலக விஷயங்கள் மீது உள்ள ஆசைகளை நீக்குவதாகவும், மிகவும் எளிதாக அடையக்கூடியதாகவும் உள்ள ஸ்ரீரங்கநாதன் என்ற மிகப் பெரிய புதையல், ஸ்ரீரங்கவிமானம் என்ற இடத்தில் உள்ளது. அந்தப் புதையலை அடைய உதவும் மந்திரவாதி போன்று நீ உள்ளாய். இப்படி நீங்கள் இருவரும் உள்ளபோது, உங்களை நாடாமல் எனது மனம் வேறு எதனையோ தேடுகிறதே! Oh Lord’s Paaduka! Well I have moved away from You, in my vacillation, without a thought for You. Let it be so. How come that You ignore me? When a calf that is in the suckling stage has gone away astray in its playful movements, what does the mother-cow do? Should You not restore me to You? 1) UtthamUr Swamy’s anubhavam: Oh Kesava PaadhukE ! Due to my agitated state of mind and its fickle nature , I may fail to think about You .Even then , You should think of me like the cow , which hastens to the side of the calf to feed it, even if the calf forgets to nourish itself due to its concentration in playing . ( Swamy Desikan begs the Paadhukais here to think of him and bless him even if he forgets to think of Them. He says that their overwhelming affection should overlook his lapses and forgive him ). 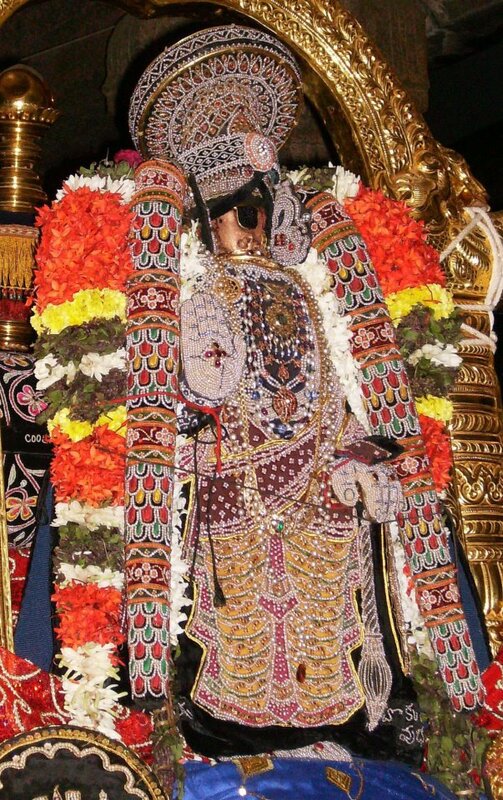 2) SrImath Andavan’s anubhavam: Oh PaadhukE , who has abundant love for those , who seek Your refuge ! When we think about the Cow that has given birth protects its new calf with unwavering attention and runs after it , whenever the calf strays away from it, Your ( Paadhukais’s) limitless Jn~Anam , Vaathsalyam, DayA should be protecting me with vigour and chase away all my sins. It is not fair of You to ignore me and let me be the victim of all the enemies , which stand in my way of attaining the sacred feet of Your Lord. 3) Oh Kesava PaadhukE , the most merciful One ! YOu may choose to ignore me ( na smarEyam yadhyapi) . How can You not think about me ( Bhavathee svayam mE na smarthum kaTam arhathi? ). Your status and mood should be like the Mother Cow who runs after the calf, who gets distracted by play and fails to nourish itself ( VathsE vihAra kuthukam kalayathi sathi, VathsalAyA: aavasTA kaa nAma ? )…(V.S). பொருள் – அழகான தலைமுடி கொண்ட ஸ்ரீரங்கநாதனின் பாதுகையே! உலக விஷயங்களில் மேயும் கன்று போன்ற புத்தியுடையவன் என்பதால், பசுவாகிய உன்னை நான் எண்ணாமல் இருக்கக்கூடும். தனது கன்று வெகுதூரம் சென்று விளையாட எண்ணும்போது, பசுவின் நிலை எப்படி இருக்கும்? அந்தப் பசு எவ்விதம் தனது கன்றைத் தேடிச் செல்லுமோ அது போன்று, நீயாகவே என்னை எண்ணி வரவேண்டும். Oh Mother Paaduka! If You were to pronounce that my sin is so powerful, let me tell You this:-You get hold of the Lord’s Feet firmly and take Him over to various places in the pretext of His strolls all around. It is Your sport to help me too! If this were absent, then it only means that my sin, that compels me to refuse and negate the Karuna of the Lord, the Moksha-giver, is the greatest force on earth! How else will I be denied the Lord’s grace in spite of Your effort? 1) UtthamUr Swamy’s anubhavam: Citing the excuse of Your Lord’s external travel , You tightly cling to Your Lord’s feet and make sure thaT He comes my way . If I do not have Your intervention, my huge sins will prevent Him from showing mercy to me. You bring Him over to me and that serves as my atonement to banish my sins .If you did not help, I will be unhappy and complain that Your Lord is merciless. How can I then praise adequately Your help ? 2) SrImath Andavan anubhavam : Oh PaadhukE ! You have unlimited affection (Vaathsalyam ) for me.Due to my limited intellect and unlimited sufferings , I assessed that You are indifferent to me and spoke rudely to you and complained that You are indifferent . Please pardon me for this apachAram. My sins are huge. The Lord is there to forgive the sinners and is ready to confer Bhogam and Mosham due to His limitless dayA. My Paapams however prevent the Lord’s sahaja krupA coming my way . At this juncture , You perform a MahOpakAram . 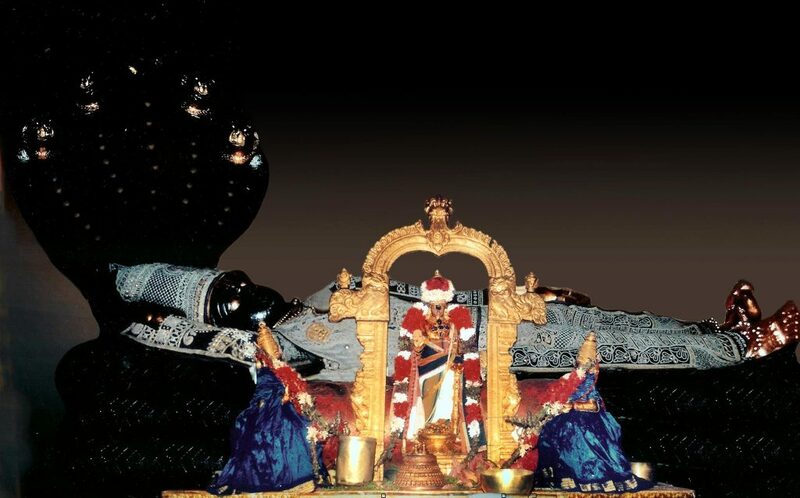 You use the external excuse of bringing PerumAL out of His sanctum for ullAsa sanchAram and hold on to His sacred feet tightly and pray for my upliftment . You make it possible for me, who did not get inside the Lord’s temple and bring the Lord before me to chase away my paapams . If you had not taken this initative , there would be no sambhandham between me and my Lord ; He would have ignored me and that would have led to my total destruction . My paapams would have won in that case. Swamy Desikan expresses sorrow (nirvEdham) over the power of his paapams for our sake . Oh Devi Gold Paaduka! You perhaps, have got intoxicated with honey from the Lord’s Lotus Feet. How elese You, with Your great mercy quality, remain heedless to my pathetic words from near You! 1) UtthamUr Swamy’s anubhavam: Oh Golden Paadhukais of the Lord ! You seem to be intoxicated from the drinking of the honey from the lotus feet of Your Lord . Otherwise , DEvi , how can I explain or understand Your neglect of my dire pleas ? Normally , You are very compassionate and respond fast to the cries of Your devotees . ( Swamy Desikan begged the Paadhukais to bring the Lord before him . They acted as though they never heard him . He expresses his sorrow and disappointment in this slOkam ). 2) Srimath Andavan’s anubhavam: Oh PaadhukE ! I am a MahA Paapi ,who dare not approach You . Inspite of that , due to Bhagavan’s anugraham ,I have been empowered to approach You . My sins have not been banished however even after seeking You as my refuge. I am standing next to You and crying with agitated voice about my unbearable samsAric sufferings. How come those pleas are not falling on Your ears ? I can not say that You are indifferent because You are heartless . You are indeed the embodiment of DayA. I can not also assess that You do not have the power to eliminate my sorrows . Among the three items needed for rakshaNam , Jn~Anam , DayA and Sakthi are included. Since You have DayA and Sakthi in abundance , it must be the lack of Jn~Anam about my sufferings that must be interfering with Your rush to protect me. I am sure that you did not reject me purposely . I surmise that It is your total immersion in the aanandhAnubhavam arising from Your drinking the madhu associated with Your Lord’s lotus feet makes You oblivious of me .My cries of suffering (Aaartha Dhvani) has therefore escaped Your ears. There are also external signs ( golden color of Yours and the lustre of Your body ) that shows off and are linkable to the golden pollen despositing on You from the Lord’s lotus feet . It is only my paapa raasis that make You deaf to my soulful cries seeking Your intervention ! 3) Oh golden PaadhukA Devi , who is the PaadhukA of the Lord, who destroyed the asuran , KaiDaban ( KaiDabhArE: Kaacnana PadhAvani DEvi ) ! You are in a state of intoxication from the consumption of the honey associated with Your Lord’s lotus feet ( KaidabhArE: Paadharavindha makarandha nishEvaNEna ksheeBA asi). If that were not so (anyaTA), You filled with DayA by svabhAbhAvam ( dayAdhikA Thvam ) will not be indifferent to me standing next to You (Thvanthikajusha:mE ) and ignore my heart rending cries for rescue (dheenAksharANi kaTam na sruNOshi )? ….(V.S) . பொருள் – தங்கமயமான பாதுகையே! கைடபன் என்ற அசுரனை அழித்த ஸ்ரீரங்கநாதனின் திருவடிகள் என்ற தாமரையில் உள்ள தேனைப் பருகி மயக்கம் கொண்டு நீ உள்ளாய். இவ்விதம் நீ மயக்கம் கொள்ளாமல் தெளிந்த நிலையில் இருந்தாய் என்றால் – கருணை நிரம்பிய நீ, எனது வருத்தம் நிறைந்த சொற்களைக் கேட்காமலா இருந்திருப்பாய் (நீ கேட்காத காரணத்தால் அரங்கனின் திருவடி அழகில் மயங்கி உள்ளாய் என்று கருத்து). Oh Mother Gold Paaduka! I have had, by You, deposited my burden at the Feet of Mukunda, the Moksha-giver. If under this circumstance, something not good, not auspicious, occurs to me, what is to happen to Your great reputation as a saviour of Prapannas? Would that reputation not be sullied to become shame-faced? 1) UtthamUr Swamy’s anubhavam : Oh Golden PaadhukA , Oh Mother ! I do not think Your reputation as the One , who delivers the Jeevans at the feet of the Lord as a part of their SaraNAgathy is sullied. You have vowed to protect the PrapannAs . Hence , I am not worried about being abandoned. No inauspiciousness will come to me because of Your established reputation as a protector of those, who have perfromed BharanyAsam . I have unswerving faith in You to take me to the Lord’s sacred feet to be blessed with the fruits of BharanyAsam. 2) SrImath Andavan’s anubhavam : Oh Golden Paadhukais with the determination to grant BhOga-mOkshams to those , who perform SaraNAgathy unto You ! With Your mighty sipArsu , You have placed the burden of my protection at the sacred feet of Your Lord. After becoming the object of both of Your protection , if any inauspiciousness occurs, it will be a slander to both of Your keerthi and Vaibhavam. There will be damage to Your Keerthi (Keerthi hAni) as a result of such lapses of failing to protect a SaraNAgathan. It must indeed be my pApams that make You ignore me unmindful of the damage to Your reputaton as unfailing SaraNAgatha Rakshakan. 3) Oh Mother ! Oh Golden PaadhukE ( Maatha: Kaanchana PaadhukE )! You have placed me at the sacred feet of the Lord, who is the grantor of BhOgams in this world and Moksham in the other world ( Mukundha PaadhE Thvadharpitha Bhara: ) . 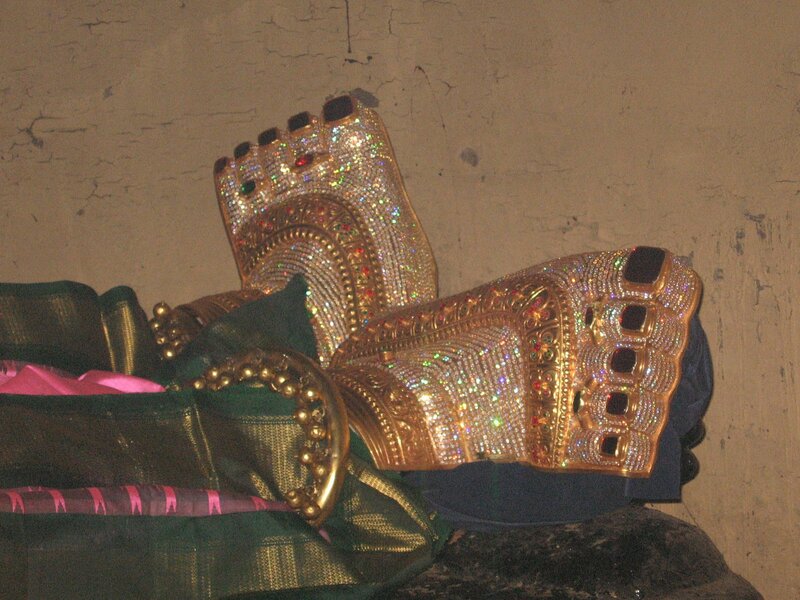 After reaching this coveted state as a Prapannan, who has performed Bhara samarpaNam, any inauspiciousness encountered by me (BhUya :bhadrEtharANi bhavanthi yadhi nAma ) in the post-prapatthi state will affect Your reputation as the celebrated One vowed to protecting ParapannAs ( Prapanna parirakshaNa dheekshithAyA: tava Keerthi: na trapEtha kim ? ) …(V.S). Oh Paaduka! I should not suffer at the hands of snake-like gate-keepers of the mole-hills of rich persons, in my efforts to get a few coppers for my living. The most valuable perennial treasure that Sri Ranganatha is, rests in You of admitted greatness. My prayer now is that You make my craving to rest in You; please grant it at once! 1) UtthamUr Swamy’s anubhavam: Here, Swamy Desikan describes the kind of inauspicousness that will not come his way due to the grace of the Paadhukais. One of the inauspiciousness that Swamy Desikan feared is that of entering the house of the wicked wealthy to request money from them to make a living . Swamy says: ” The houses of the wicked wealthy are in reality the residence of poisonous snakes. Rich are the big snakes with the twin tongues. They say one thing and do not stick to it the next time. When You are in Srirangam blessed by the permanent wealth known as RanganAtha , I do not need to enter the house of the haughty rich; I will turn my attention to You and fulfill my heart’s desires . May Thou keep me restful quickly in Your shade ! 2) SrImath Andavan’s anubhavam:Oh PaadhukE ! There are those, who deluded by their wealth do not realize that wealth is perishable and their exalted status and riches are transient. Forgetting these facts, they become haughty and arrogant. Even the servant in front of such rich men insult the visitors with harsh words just like their masters. Entering their houses is like entering the abode of poisonous snakes . One is terrorized over the thought of entering the houses of these haughty rich and coming out of them safely . It is the poverty and desire for wealth makes the SamsAris enter the houses of these kings of misers. It is indeed a delorable state. Wont You keep us away from the houses of the rich and direct us towards the house of Your Lord, who is sarva sulabhan and the possessor of undiminishing auspicious wealth of every kind ? Thus laments Swamy Desikan. 3) Oh PadhAvani ! I am saddened by my decisions to enter the doors of the arrogant rich guarded by the hissing snake like door keepers ( dhouvArika dhvirasana praBalAntarAyai: dhurADya Bhila pravEsai : aham dhUyE ). 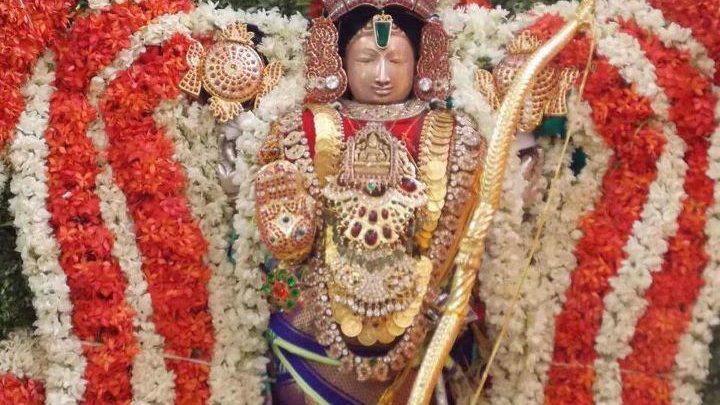 To remove my sorrows arising from my pravEsam into the houses of the arrogant rich,You must fix my firm attention and desire with Your Lord, the source of all undiminishing riches ( Tath RangadhAma nirapAya dhana uttharAyAm , manoraTam munkshu visramaya)….(V.S). பொருள் – ஸ்ரீரங்கநாதனின் பாதுகையே! பாம்பின் புத்துக்கள் போன்று இந்த உலகில் உள்ள தீமை நிறைந்த செல்வந்தர்களின் வீடுகள் உள்ளன. அந்த வீடுகளின் வாயிலில் உள்ள வாயிற்காப்போன் பாம்பு போன்றே உள்ளான். இப்படிப்பட்ட இடையூறுகளால் நான் பலமுறை துயரப்படுகிறேன். ஸ்ரீரங்கநாதன் என்ற அழிவற்ற பெரும் செல்வத்தை நீ எப்போதும் தாங்கியபடி உள்ளாய். இப்படிப்பட்ட உன்னிடம் நிலையாக இருக்கும்படி எனது ஆசை என்ற தேரைச் செலுத்தி வருவாயாக. Oh Paaduka! In the world of Samsara, which is a sultry summer, in which the three heats afflict us, we seek relief from the mirages of sense-experiences, that are a consequence of Maya or Moolaprakriti with its manifestations of sound, etc. At this moment of disillusion, You cling to the Feet of the Lord firmly and declare to us, `This is the Supreme Goal of Life’. It allays all our doubts and we secure a steadfastness. 1) UtthamUr Swamy’s anubhavam : Oh PaadhukE ! We suffer from the three afflictions — AdhyAthmikA , AadhiboudhikA and Adhidhaivika –of SamsArA and are emaciated by the heat of Maaya based on the admixture of Rajas , Tamas and Satthva . We get lost in this mirage. You take Your hands and touch Your Lord’s feet and show them to us very clearly. You point out that those holy feet are the highest goal for us so that we can get relief from the three samsAric afflictions and feel cool and comfortable . You bless us with that type of true knowledge. 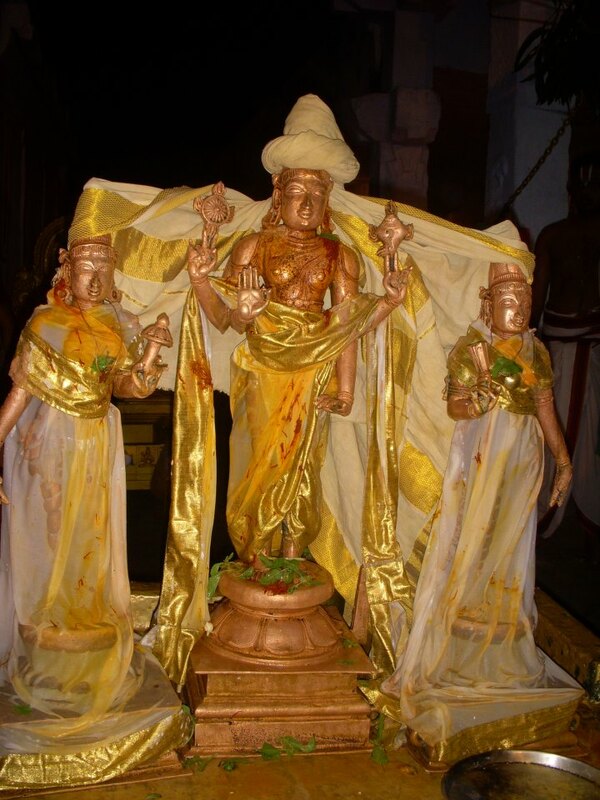 2) SrIamth Andavan’s anubhavam: Due to the power of our ancient karmAs, we are bound by the three guNams and engage in pursuit of transient and perishable things linked to SamsAram . We have hence nothing but sorrows and pain. We run after the mirage and tire. At this time of our suffering, You point out Your Lord’s sacred feet to which You are linked and identify them as Parama PurushArTam ( the ultimate goal of life ). You show us that those sacred feet are our upAyam and phalan for overcoing samsAric sufferings . Inspite of all these efforts on Your part, we do not learn and get tossed around in the waves of SamsAram . What a pity ? 3)Oh CharaNAvani ! You are touching the sacred feet of the Lord (Thvam samsprushta Souri charaNA). We are deluded by the mirages of the summer of samsAram as a result of our exposures to the three kinds of tApams ( Thrividha TaapamayE nidhAdhE , mAyaa visEsha janithAsu mareechikAsu vyAmuhyathAm na: ). For suffering souls like us , Oh PaadhukE ! You serve as the remover of the doubts about which real pools of water to drinkfor gaining Moksham and to stay away from the mischevous mirages (charamE pumarTE svayam sTEyA bhavasi) …(V.S). பொருள் – ஸ்ரீரங்கநாதனின் திருவடிகளைக் காப்பாற்றும் பாதுகையே! ஆத்யாத்மிகம், ஆதிபௌதிகம் மற்றும் ஆதிதைவிகம் என்ற மூன்று விதமான வேதனைகள் நிறைந்த கோடைகாலம் போன்று இந்த ஸம்ஸாரம் உள்ளது, இந்தக் கோடையில், ப்ரக்ருதியின் மூன்று குணங்களானவை கானல்நீரைப் போன்று தோன்றி, எங்களை மயக்கியபடி உள்ளன. இந்த நேரத்தில் ஸ்ரீரங்கநாதனின் திருவடிகளை எப்போதும் வருடியபடி உள்ள நீயே, உயர்ந்த புருஷார்த்தமான மோக்ஷ விஷயத்தில் எங்களிடம், ”இந்தத் திருவடிகளைப் பாருங்கள் – இதுதான் உயர்ந்த மோக்ஷம். இது நிச்சயம் கிட்டும்”, என்று கூறுகிறாய் போலும்.